Baseball's controversial reserve clause was born in 1879. On September 29, the owners of the four-year old National League met in Buffalo (one of the eight cities in the circuit). A uniform contract will be used by all clubs. No advance money will be paid to players. All contracts shall date from April 1 to October 21. The rule prohibiting hiring or negotiating players prior to November 1 was changed to October 1. However, the owners also signed a secret agreement that allowed each club to name five men who would be "held inviolate; that is, no club would have a right to approach them or sign them without the consent of said club. The delegates all selected their five men. ..."
It didn't take long for the news to leak, however. The next day, the sports editor of the Cincinnati Enquirer, O. P. Caylor, reported the agreement, although he didn't learn the names of the reserved men on any club. Caylor: All the delegates believe that this rule will solve the problem of how to reduce wages, and feel confident it will be lived up to. The rule would reduce wages because owners could cut the salaries of their restricted players without fear of the man moving to another club. And since the NL was considered the only "major" league, any player shifting to another league would receive a smaller salary. The owners also agreed not to play any club, even from outside the league, that hired a reserved player. While the reserved players lost bargaining power, the rule added stability to the league and lessened the chance of clubs going broke and eliminating jobs. Generally, the clubs reserved a pitcher, a catcher, at least one infielder, and at least one outfielder. Four future Hall of Famers made the restricted lists. P John Montgomery Ward, Providence Grays (HOF 1964) - only player in ML history to total more than 2,000 hits and 150 pitching victories. Over the years, the owners increased the number of reserved players until almost the entire roster was covered. Ward founded the Brotherhood of Professional Base Ball Players in 1885 after graduating from Columbia Law School. His main impetus was frustration with the owners' reserve clause. The players gained some power when they were allowed to negotiate with other teams if their current club asked them to take a cut in pay. 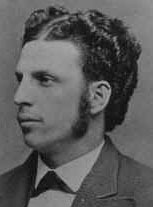 Ward started the Players' League in 1890 with over half the players from the National League joining the new circuit. But the league lasted just one season. 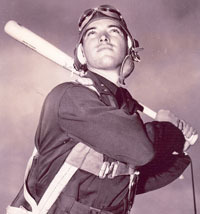 December 12, 1940: Billy Southworth Jr. became the first professional baseball player to enlist in the armed forces prior to World War II. 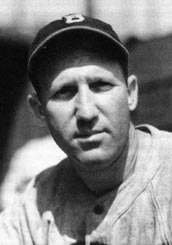 He had played the 1940 season for the Wilmington Blue Rocks of the Interstate League and the Toronto Maple Leafs of the International League. The son of St. Louis Cardi­nals manager Billy Southworth, Billy Jr. became a decorated bomber pilot in the U.S. Army Fair Forces during the war. Rising to the rank of major, he died on February 15th at the age of 27 after his B29 crashed on a training flight off the coast of Flushing, New York. May 13, 1942: Jim Tobin of the Boston Braves be­came the first - and to date the only - pitcher to hit three HRs in one game since the 19th century. 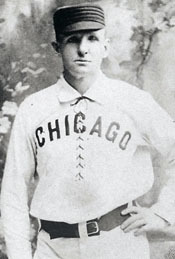 Tobin accomplished the feat in a game at Braves Field against the Chicago Cubs. The first two roundtrippers came with the bases empty while the last one drove home a base-runner in the 8th to give the Braves a 6-4 lead. Tobin surrendered a run in the 9th but held on for the 6-5 victory. Jim ended his nine-year major league career with 17 HRs and a .230 batting average. 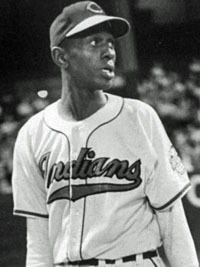 October 10, 1948: Satchel Paige of the Cleveland Indians entered the 5th game of the World Series against the Boston Braves in the 7th inning with one out and runners on 1st and 3rd. The 42-year-old right­hander retired P Boston Braves on a sacrifice fly, then got Boston Braves to ground out. Satch thus became the first African-American to pitch in a World Series. NOTE: Brooklyn P Dan Bankhead entered the 1947 World Series as a pinch-runner. 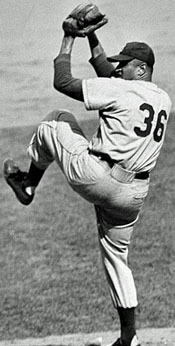 October 11, 1949: Don Newcombe of the Brooklyn Dodgers became the first African-American pitcher to start a World Series game. He battled the Yank­ees' Allie Reynolds through eight scoreless innings before allowing a HR to Tommy Henrich in the bottom of the 9th to lose 1-0.